The preliminary daily climate report as of 5 pm today shows a high temperature of 101° and a low of 81°. The high has easily broken the old record of 96° for July 24 (set in 1987, 1968, and 1884). The low, assuming it holds through midnight standard time (1 am EDT), will also break the previous record high minimum of 78°, also set in 1987. Today's record temperatures bring the July month-to-date average up to 83.4°. If it were to hold through the end of the month, this would be a new record hottest July. Given the somewhat less hot temperatures forecast for next week, at least a tie for the record is likely. The summer season-to-date average of 81.8° is also running well above the pace of the previous hottest summer of 1980. Record-breaking rainfall caused widespread flooding across southern Wisconsin on Thursday. In Milwaukee, many roads and the city's airport were closed by high water. 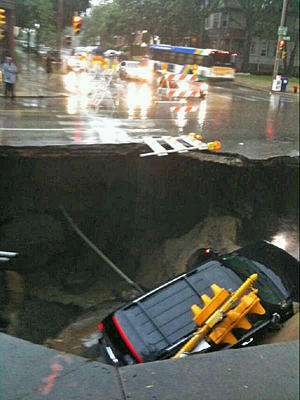 A sinkhole 40 feet wide and 20 feet deep swallowed a Cadillac SUV with the driver inside, along with a traffic light. The driver was rescued, although the fate of the vehicle was less certain. The 5.79" of rain at Milwaukee was over 4 times the old record for the date, and it was the second highest daily precipitation of all time, second only to the 6.81" on August 6, 1986. The 3.62" at Madison broke the old record for the date of 2.21" in 1885. A large area of moderate to heavy rain moved through southern Wisconsin Thursday morning, dumping 1.5 to 2 inches of rain across areas west of Madison, and .50 to 1.5 inches of rain east of Madison, including the Milwaukee metropolitan area. Milwaukee's Mitchell International Airport received 1.44 inches of rain during that morning round. Madison's Dane County Regional Airport received 1.47 inches. This helped set the stage for the major flooding that ensued later in the day. During the afternoon, a persistent band of strong to severe thunderstorms developed and moved very slowly over south central and southeast Wisconsin through the evening hours. The individual storms were moving quite fast, about 40 to 50 mph, but the line containing these storms didn't, resulting in storms repeatedly training, or moving, over the same area. WIdespread 3 to 4 inch amounts were reported along and either side of the I-94 corridor, with locally higher amounts of 5 to 8 inches. Widespread reports of flooding and flash flooding associated with the heavy rain were received across southern Wisconsin, sending rivers and streams above flood level and water flowing over roads and stalling cars. Traffic was stopped on various stretches of the interstate system throughout downtown Milwaukee at the height of rush hour. Many motorists were stranded in their cars until the waters receded enough for traffic to move again. Mitchell Field recorded 5.79 inches for the day...breaking a record for the date. The previous record was 1.26 set in 1948. This also is the second highest daily rainfall total on record for Milwaukee. The greatest one-day precipitation record was the 6.81 inches which fell on August 6, 1986. Madison also set a record for precipitation for the date at 3.62 inches. This beat the previous mark of 2.21 inches set in 1885. The 3.62 inches ranks 13th for the most precipitation in one day. The record is the 4.96 inches which fell on August 8, 1906. Green Bay, Wisconsin has already set a new July monthly rainfall record with 7.84". The normal rainfall amount through July 22 is 2.43". 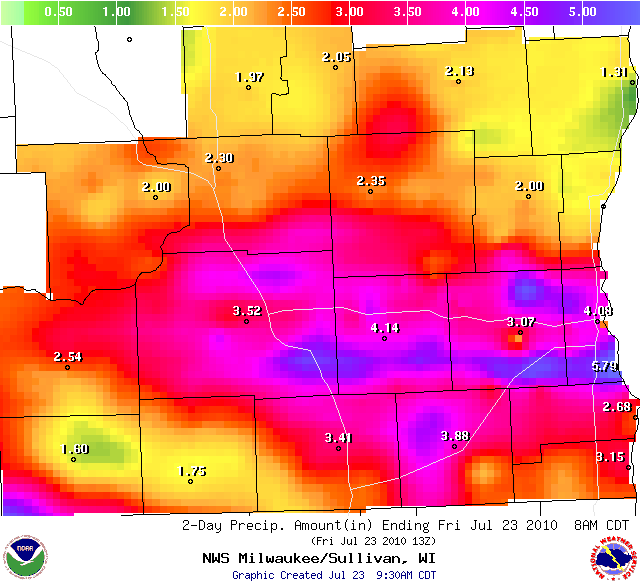 Rainfall amounts of 3.5" to over 4" were reported in northern Illinois. Through 1 pm today, Rockford Illinois received 4.27", smashing the 1973 record of 1.73", and additional rainfall is possible through the rest of the day. Flooding also occurred across Iowa, where the 2.24" broke the old daily record of 1.55" set in 1924 at Waterloo. Midnight Update: After dropping to 90°, the temperature is back up to 91° at midnight; the temperature has now been at 90° or higher for 13 consecutive hours. 8 PM Update: The high has actually popped up to 98° after 5:00. With a high so far today of 97°, this is now the 10th consecutive day of 90° temperatures or higher in Washington, the second time this has occurred in the summer of 2010. The even hotter readings expected tomorrow will undoubtedly tie the 11 day stretch of 90°+ in June. How do these current year heat waves compare with those of the past? 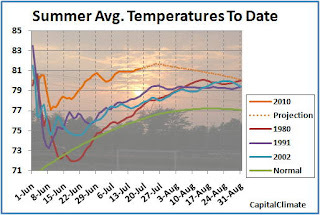 Since temperature records began at or near the current location of National Airport in 1929, there have been 12 periods of 12 or more consecutive days with 90° temperatures or higher. The record, by far, was set by the 21 days ending August 14, 1980. That heat wave began with only a 2-day break following the 9-day streak ending on July 22. Ten days following the record streak, another 14-day streak extended from the last week of August through September 6. In all, there were a record 67 days of 90°+ temperatures in 1980, which also holds the current record for the hottest summer. The earliest 90° reading that year was May 13, and the latest was September 23. 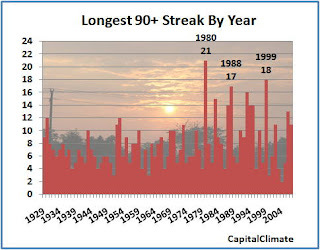 The second and third place holders for heat wave length in the modern era are 1999 (18 days) and 1988 (17 days). Temperatures are expected to moderate somewhat by early next week, but forecast highs of 90° or warmer through at least next Thursday could bring the current streak to 16, which would tie the 4th place record set on July 18, 1993. July 23, 1 AM Update: The midnight (standard time) temperature of 82° is in, so the low of 79° holds, just 2° below the record high minimum for the date. A couple of high minimum records are vulnerable over the weekend with 78° on Saturday and 79° on Sunday and Monday. NOAA's Climate Prediction Center data shows that the 31-day running mean of temperature departures has not been negative since the end of February. July 22 Update: The preliminary high/low of 96° and 79° today push the month to date (2010 TD) to 82.8°, firmly in position as the 3rd hottest July. The projection (2010 Proj) moves to 83.0°, tied for 2nd and within striking distance of the record for hottest July. PM Update: Today's preliminary high comes in at 93° with a low of 75°. High temperatures generally in the low 90s (including a high as of 2 pm today of 91°) and lows in the mid 70s so far this week have continued to inch the Washington cumulative summer average higher, to 81.4° through yesterday. Forecast temperatures in the upper 90s to near 100° over the weekend will likely push it even further, to 81.8° by Sunday. Even with normal temperatures from the remainder of July through August, the final summer average would be 80.2°, a new record high. Meanwhile, the July monthly average continues to increase as well, standing now at 82.6° (2010TD on the chart), tied with 1987 for third hottest July. Projections based on the next 7 days of forecasts and climatology would keep the final monthly average at the same value (within rounding error). PM Update: It's 92° at 3 pm, so the Washington summer average temperature moves up to 81.3°. As noted in the previous post, the summer of 2010 reached the halfway point well on its way to being one of the hottest since Washington weather history began in 1871. 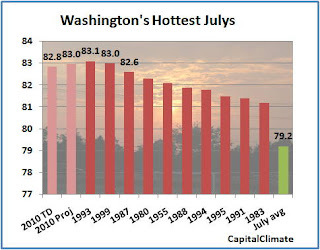 The chart on the right shows that it would be quite feasible to set an all-time summer heat record. 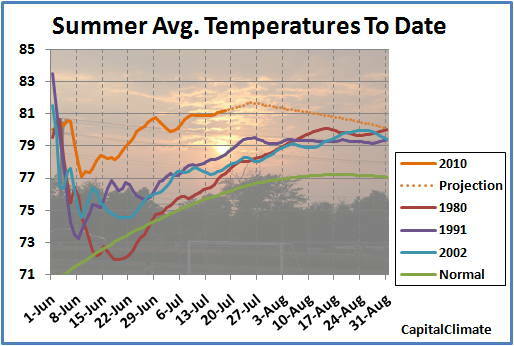 Each line on the chart represents the cumulative average summer temperature from June 1 through the given date on the x-axis. The temperatures are shown for 2010, the current hottest summer of 1980, and the two runners-up, 1991 and 2002. The lower green curve, labeled "Normal", is the 30-year climatological average from 1971-2000. The observed data so far this year is shown as a solid line, and the dotted line is a projection for the rest of the summer. Note that this is called a "projection", not a forecast. It includes the official National Weather Service forecast for today through the 25th, posted at noon today, followed by the climatological average from July 26 through August 31. Using this relatively conservative projection, the final average for summer 2010 would end up being 80.1°, edging out the previous record by 0.1°. Here are a few points to consider about the chart. An average, of course, is simply an arithmetic calculation based on the sum of a group of numbers, so order has no effect. On the other hand, once a certain subset of the numbers are already known, each additional number will have a smaller effect on the final result. This means that the lines start jumping around a lot with the first few points in June, but they begin to settle down as more points are added moving to the right. Interestingly, all 4 of the years shown started off well above average in early June, then declined substantially later in June before rising again to approach their final values. In 1980, the average declined so much that it was below normal for most of 2 weeks from June 13 to the 27th. In fact, although all 3 months were above normal, June was only slightly above, and August was the warmest month, setting the record for that month. Although 2010 started off a little slower than the other years, it had much less of a dip in late June, going on to set the record for the month. It has continued to steam on (literally) through July to reach the current value of 81.2°, which is likely to rise by another 0.1° if today's high goes up by 1° and the morning low of 77° is not exceeded on the down side. This year's trend could be reversed, of course, by a cool August, although that's not in the current long-range forecast. Notice how 2002 was in the lead in late August until a cool snap knocked high temperatures into the low and mid 70s for the last 4 days. Barring such a reversal, however, this should be an interesting race for the next 6 weeks; the chart will be updated through the summer as conditions warrant. It's also an instructive example of how, hour by hour, day by day, week by week, month by month, season by season, weather becomes climate.